Hello Everyone! I hope you all are well. Today is a dreary dark and I mean so dark that I have extra lights on to make me think it’s really daytime. The rain is coming down hard and I am dreading pick up today. The idea of standing in a downpour for over 10 minutes is not appealing the least to me. Right now it is coming down so hard it is like a sheet of rain that you can’t see through. On the sunnier side of things I wanted to share this super cute step card I made for my dear friend Ashley’s baby girl, who just turned 1. I found this cute file on the Silhouette design store and had to have it. 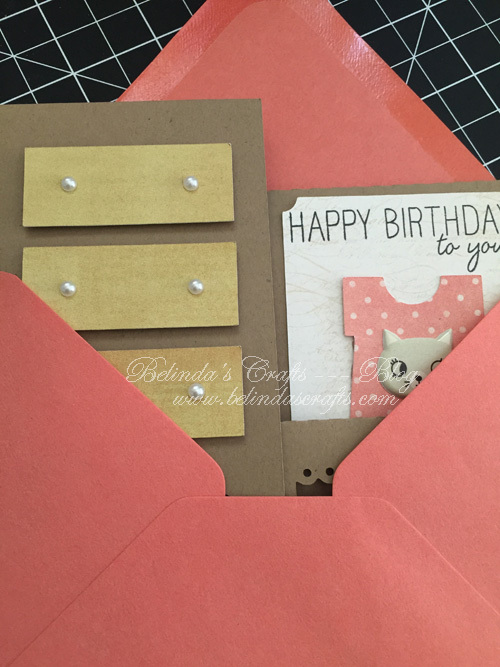 I was so happy when I found the polka dot paper that matched my envelope from Paper Source. The little puffy kitty embellishment is from none other than Crate Paper. The product is called Wonder and it has the cutest puffy stickers in this set. I actually received it in my Gossamer Blue kit. 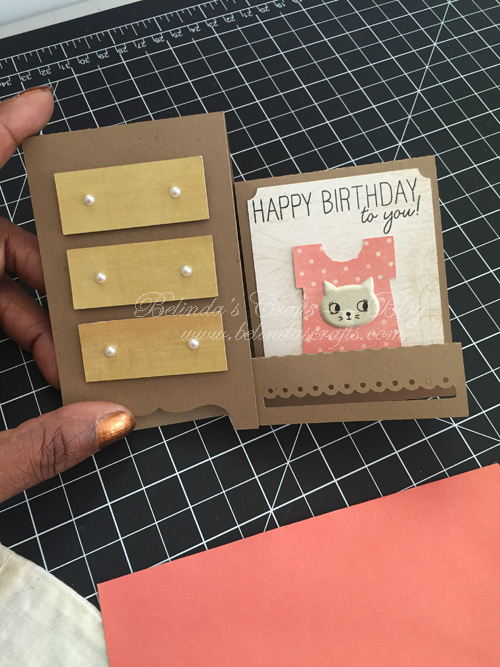 I used pop dots to give the dresser drawers more dimension and added pearls for the draw pulls. It came together rather quickly and I just love the warm color palette. I used one of the canvas bags I bought last year on clearance at Target to hold the envelope and used foam letters to personalize the bag. We had a really nice time at the party and the weather was great so the kids could play outside. I am off now to get some work completed before that dreadful, drenching I will experience today at pick up!! 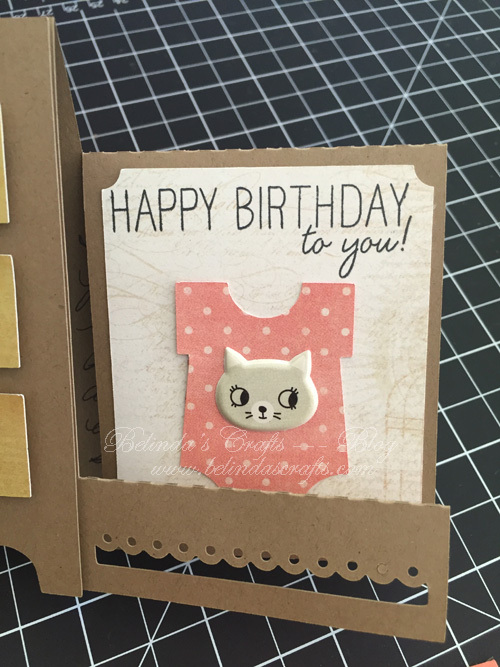 Next PostHappy World Cardmaking Day! Previous PostHappy Mail: Some pre-orders have arrived! The card was beautiful!!! And I’ve saved the bag for a special use! 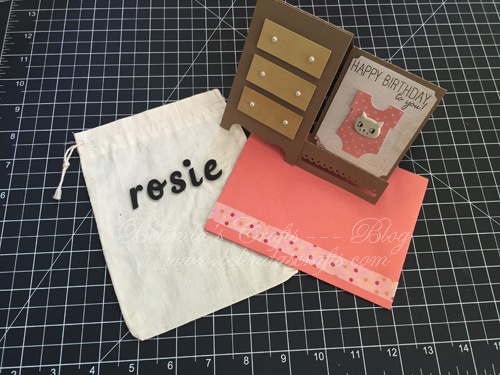 Such a cute card and I love the idea of a canvas Baggie! Thanks Maria! I love when I remember to use stuff I have hanging around in my craft room.